As the Official Medium Shelter System of the United States Air Force, the California Medium Shelter System (CAMSS30) is widely depended on to support troops around the world. Over 2,500 shelters have been deployed from the extreme heat of the Middle East to the freezing temperatures of Alaska. The CAMSS30’s superior engineering has proven to hold up in extensive U.S. government lab tests and repeatedly in the field under extreme environments. The versatility of the CAMSS30 can be seen in its numerous applications. The Air Force BEAR program used this shelter for flight line support and back-shop maintenance of avionics, aerospace ground equipment (AGE), fuels laboratory, crash rescue, squadron operations, as well as more general functions. The California Medium Shelter System (MSS) has also fulfilled the need for command posts, sleeping quarters, dining facilities and recreational centers among others. The complete California Medium Shelter System is compact and ready to ship by air with all the tools necessary for easy assembly. The system has been AFOTEC tested to assemble in under 4 hours. 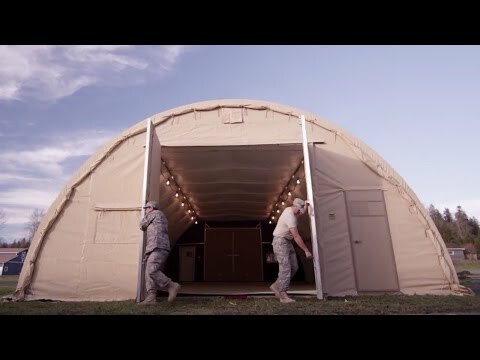 As the Official Medium Shelter System of the United States Air Force, the California Medium Shelter System (CAMSS30) is widely depended on to support troops around the world. Over 2,500 shelters have been deployed from the extreme heat of the Middle East to the freezing temperatures of Alaska. The CAMSS30’s superior engineering has proven to hold up in extensive U.S. government lab tests and repeatedly in the field under extreme environments. The versatility of the CAMSS30 can be seen in its numerous applications. The Air Force BEAR program used this shelter for flight line support and back-shop maintenance of avionics, aerospace ground equipment (AGE), fuels laboratory, crash rescue, squadron operations, as well as more general functions. The California Medium Shelter System (MSS) has also fulfilled the need for command posts, sleeping quarters, dining facilities and recreational centers among others. The complete California Medium Shelter System is compact and ready to ship by air with all the tools necessary for easy assembly. The system has been AFOTEC tested to assemble in under 4 hours.